Modern technological advancements in LED lighting management systems have revolutionized the lighting industry, providing highly improved performance, enhanced efficiency and economically viable lighting solutions for both residential and commercial applications. In last month's post, we introduced our 0-10V dimming module and digital addressable lighting interfaces (DALI) dimming module, two LED lighting components that offer true innovations in dimming control for projects of varying size and scope. Working alongside those components is the digital multiplex (DMX) control, a key element implemented in color mixing applications and the newest innovation in GRE Alpha's LED lighting management system offerings. Transitioning from traditional lighting systems to LED lighting was the first step in lighting management system evolution. That was followed quickly by the need for dimmer switches for the much brighter, more efficient residential and corporate LED lighting solutions. As LED lighting systems have evolved and become more widely adopted, and the number of new applications for LED lighting continue to evolve, color mixing opportunities have also increased. This is where DMX lighting control protocol becomes important. DMX is a standard element of digital communications often used for lighting stages, building façades, entertainment and other systems requiring coloration effects. As pricing for LED lighting with color has decreased, LED color mixing has seen an increased demand for use in architectural and residential applications. Both use the DMX lighting protocol to create environmental moods, enhance productivity and provide simple, flexible lighting control applications. Boasting a simple plug-and-play design that works with CV systems, GRE Alpha's DMX dimming module can upgrade existing non-dimmable systems to work with DMX lighting protocol - simply by adding the dimming module. It follows the latest DMX 512-A protocol, the current standard for manufacturing and intensities as set by the Entertainment Services and Technology Association (ESTA). Adhering to DMX 512-A protocol allows the GRE Alpha DMX product to seamlessly integrate with existing DMX-enabled control consoles and dimming panels. Additionally, GRE Alpha's DMX dimming module is remote device management (RDM)-enabled, allowing for simple, two-way communication between DMX devices and lighting consoles. Unlike other DMX dimming modules, GRE Alpha's DMX dimmer uses a 4-in-1 LED chip that offers four color channels - red, green, blue and white or amber (RGBW/RGBA) - instead of the basic three-channel red, green, blue (RGB)color control. This gives users four types of colors to mix for proper ambiance, allows for precise control of the white/amber color and affords the option to create a wider range of customized color shades. The GRE Alpha DMX dimming module is at the forefront of color application in LED lighting management systems. As costs for color variation continue to become more efficient, the LED lighting industry will continue to produce color mixing DMX lighting options for the masses. GRE Alpha has launched three new products this summer and is not done yet. 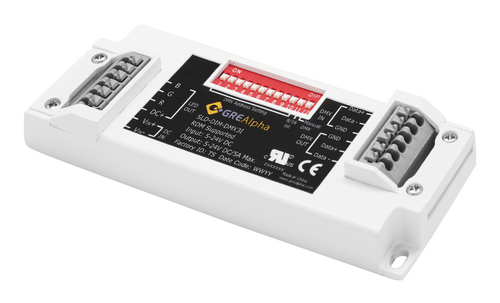 In addition to the 0-10V dimming module, the DALI dimming module and the DMX dimmer, there is yet another product coming soon to the GRE Alpha line. Stay tuned for updates as the summer continues. GRE Alpha is committed to innovation and to delivering high-quality, leading-edge LED lighting solutions. For more information about products, or to speak with a GRE Alpha product expert, visit the Enquiries page and fill out the Enquiry form.